A Modern Pharaoh? Egypt’s democratically elected, but Islamic Brotherhood-backed president, Mohammad Mursi, has brought about drastic changes since his election. He “has issued a declaration banning challenges to his decrees, laws, and decisions” (BBC, November 22, 2012). He has also declared that “no court can dissolve the constituent assembly, which is drawing up a new constitution” (ibid.). Apparently emboldened by his recent success brokering a ceasefire between Israel and Hamas, President Mursi recently fired the chief Egyptian prosecuto r, and “ordered the retrial of people accused of attacking protesters when ex-President Mubarak held office” (ibid.). Opposition groups have stated that the legitimacy of the Egyptian legal system is now in question. The leader of the Egyptian opposition, Mohammed El Baradei, “accused Mr. Mursi of acting like a ‘new pharaoh’” (ibid.). Since the “Arab Spring,” events in Egypt have been of great interest to both politicians and the military. Bible prophecy indicates that Egypt will continue to be a “hot spot” until shortly before the return of Christ. Daniel prophesied, “At the time of the end” a “King of the South”—probably a federation of radical Arab nations—will arise to confront a European Beast power. However, this European Beast power, or “King of the North,” will ultimately attack the King of the South and overrun Egypt, Libya and Ethiopia (Daniel 11:40-43). In light of these prophecies, the term “new Pharaoh” may take on real meaning. Time will tell whether Mr. Mursi will fulfill this role. While at this time, I do not consider it likely that Dr. Morsi (also spelled Mursi) will be the final King of the South, his decrees are certainly consistent with what will be expected later. Is Egypt’s president fulfilling biblical prophecy? As massive demonstrations rock Egypt, some are protesting against Morsi, while many others are protesting in support of him. As violent clashes between the two groups erupt, it is clear that Egypt is a deeply divided nation. How far will it all go? Could Isaiah’s prophecy of an Egyptian civil war be seen in our day? CAIRO (AP) — An Islamist-dominated panel is voting on Egypt’s draft constitution, the country’s first charter after the uprising that toppled Hosni Mubarak. The draft largely reflects the conservative vision of the Islamists, with articles that rights activists, liberals and Christians fear will lead to restrictions on the rights of women and minorities and civil liberties in general. I expect more protests in Egypt and other part of North Africa and the Middle East before the final King of the South has his confederation–a confederation which is tied to Egypt (Daniel 11:40-43; Ezekiel 30:1-9). The mediums and the sorcerers. The powers that Dr. Morsi declared are consistent with the type of decrees that one would expect from a Caliph or the final King of the South. If any survive, they will probably be cited as a precedent by the final King of the South once he is in power. The painting by Michael D’Antuono is part of a larger exhibit called “Artists on the Stump – the Road to the White House 2012.” It’s on display at the Bunker Hill Community College Art Gallery until Dec. 15th. The painting is called “Truth” – and shows the president with his arms outstretched. A crown of thorns rests on his head. A spokesperson for the art gallery told Fox News there hasn’t been any criticism of the painting…. As the USA regresses, it has become more tolerant of such falsehoods–it is absurd to call that painting “Truth.” Sadly, some others have suggested that Barack Obama is some type of lord and savior (see, for one example, Obama Called ‘Lord and Savior’). 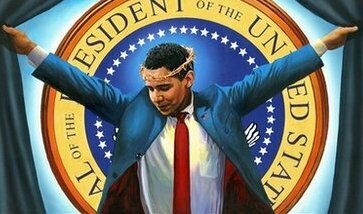 Of course, those who read enough of the Bible are aware that Barack Obama is not our “lord and savior.” 24 of the 24 times (NKJV) the New Testament uses the term “savior” it is a direct reference to God and/or Jesus Christ. Luke writes in chapter 10, verse 18 that Jesus said: “I saw Satan ‘fall like lightning.’ The Hebrew translation is “baraq o bamah,” according to Strong’s Concordance word numbers 1299 and 1116. While I do believe that Barack Obama is apocalyptic (his office and actions are leading to the time that the Beast and final Antichrist will rise up) and even list 17 reasons why I feel that Barack Obama is apocalyptic in my book Barack Obama, Prophecy, and the Destruction of the United States, there is no possible way that Barack Obama is the final Antichrist (my book explains more on that as well). President Obama has hardened his views on “fiscal cliff” … in higher taxes over 10 years, and presidential control over the national debt limit. The above prophecy will be fulfilled at the time of the end (cf. “The message was true, but the appointed time was long…in the latter days, for the vision refers to many days yet to come”, Daniel 10:1,14). Habakkuk 2 was not fulfilled in its entirety anciently. (Also, it makes little sense that Habakkuk would be directed towards the modern nation of Israel as it does not have enemy creditors.) Habakkuk’s writings must be referring to a nation or group of nations with some prominence at the appointed time. And now the USA, which is a highly prominent nation, is the most indebted nation of all time. “Because you despise this word, And trust in oppression and perversity, And rely on them, 13 Therefore this iniquity shall be to you Like a breach ready to fall, A bulge in a high wall, Whose breaking comes suddenly, in an instant. Of course, more and more, the Anglo-American nations are trusting in policies that encourage perversity. US President Barack Obama now endorses homosexual marriage, as do more and more states in the USA. This is also apocalyptic. Much is going on in the USA that is of religious and prophetic concern. But, despite what some may say or hope, while Barack Obama is a political leader, he is not the USA’s savior nor is he the final Antichrist. But he has taken steps that I have often characterized as apocalyptic. Storms, wildfires, earthquakes and other natural disasters are increasing at a staggering rate. These catastrophes cause massive power outages, food shortages, and billions of dollars in damages to personal lives and property. Do we see these events, and think to ourselves, “Wow! I am glad that didn’t happen to me!” or are we asking ourselves the question, “Am I ready for such an event?” Natural disasters are going to happen, and sometimes they come without warning. Will you be ready when disaster comes? Are you preparing like the ant? The ant is a small creature without human intelligence, yet it teaches an important lesson in preparing for future disasters. The ant treats each coming winter as a natural disaster. If it is caught above ground during the freezing temperatures, it will die. To survive the winter, an ant colony must prepare and store a surplus of food during the summer; then its members can live below ground and survive on their provisions. How does this relate to us? God admonishes us to “consider the ant and be wise, which, having no captain, overseer or ruler, provides her supplies in the summer and gathers her food in the harvest” (Proverbs 6:6-8). The ant diligently prepares to survive the winter. Its lesson for us is to be industrious and proactive in our preparations. The ant gathers supplies and food, storing it away for the coming disaster—and we should do the same. Begin making a plan now. Do not wait! Like the ant, your very survival may depend on it. The Federal Emergency Management Agency (FEMA) offers many helpful hints on how to prepare for disasters. One example is to have a plan for communicating with family members in case of disaster. Power may be cut, cellphones and GPS systems may be down, and roads may be unusable. So, family members and loved ones should plan in advance how they will re-connect after a disaster, so they can avoid becoming confused or panicked. FEMA also encourages citizens to build a supply of canned food and water at home. An easy way to do this is to buy some extra cans of food and a jug of water whenever you go to the grocery store. Make storage space at home and be disciplined about not using the food and water unless it is near its expiration. Even two weeks of supplies may make the difference in surviving a disruption. Another way to prepare is to pick up some cold weather survival equipment from an outdoor retail store, in case disaster happens in winter and there is no working heat. Consider purchasing a tent and some sleeping bags in case your home is destroyed and the emergency shelters are full. If you have a working fireplace at home, or a fire drum, prepare wood under a tarp, in a shed or in a garage. Start formulating ideas now and build your survival plan. Prepare like the ant and be ready for the next disaster. Jesus Christ warned that at the end of the age, there would be “famines, pestilences, and earthquakes in various places” (Matthew 24:7-8). He said there would be a time of confusion and great fear with “the sea and the waves roaring” and “men’s hearts failing” (Luke 21:25-26). Christ knew there would be massive hurricanes, tornadoes, wildfires, earthquakes and tsunamis that would cause billions of dollars in damage, and would devastate large communities. Food shortages and diseases are always linked to disasters, by which many will be taken off guard. Christ gave us these warnings for our admonition, encouraging us to “watch therefore, and pray always that you may be counted worthy to escape all these things that will come to pass” (v. 36). Will you be caught off guard or will you be ready? Consider the ant and prepare, being wise to escape the coming danger. For those called by God, there are also spiritual preparations to be made for the momentous times ahead…The word of God is a vital part of any good plan. Natural and other disasters are coming to the United States, and it is true that everyone should try to have supplies to handle disasters. 4:17 Therefore, to him who knows to do good and does not do it, to him it is sin. 5:1 Come now, you rich, weep and howl for your miseries that are coming upon you” (James 4:17; 5:1). Bad times are coming per Jesus (Matthew 24:4-21). What will you do about it? Be ready! To be ready means to prepare. In the above case spiritually, but likely in several ways physically. The Bible says that humans should at least do what the ants do. Do you? God’s Grace is For All Is being Jewish a hinderance to salvation? What about not being a descendant of Israel? What does the Bible really teach? True vs. False Conversion Are you really converted or willing to be? What is true conversion? What is false conversion? What are the dangers of false conversion? Evangelist Roderick Meredith provides information on those important questions. Barack Obama, Prophecy, and the Destruction of the United States This is a 160 page book for people truly interested in prophecies related to Barack Obama and the United States, including learning about many that have already been fulfilled (which the book documents in detail) and those that will be fulfilled in the future. It also has a chapter about Mitt Romney. This book is available to order at www.barackobamaprophecy.com. The physical book can also be purchased at Amazon from the following link: Barack Obama, Prophecy, and the Destruction of the United States: Is Barack Obama Fulfilling Biblical, Islamic, Catholic, Kenyan, and other America-Related Prophecies? BRUSSELS – The EU commission Wednesday published its vision for a “genuine” economic and monetary union (EMU) under which national budgets could be vetoed and a central European budget would allow transfers for troubled countries. Within the next 18 months, the EU should set up a banking union and establish a “convergence and competitiveness instrument” – money that member states would use to undertake structural reforms…Within five years, the “convergence instrument” would be built up into a separate eurozone budget that would be funded by own taxes in the eurozone…. In case any in the UK did not know where the EU wants to head, they now should know. ‘Full integration’ will not be limited to economic matters, but will include political and military integration as well. Thus, the Bible shows at least one restructure above, and really it seems like two. And those may well come after the two type of changes that the EU Commission is recommending (though it could include one or two of them). The ancient tower of Babel was supposedly built to cause a certain type of peace and likely economic prosperity. The builders,interestingly, were afraid of God per Genesis 11:1-9 and God was not pleased per Genesis 11:5-9. Although the Europeans hope that the EU contributes to peace and prosperity and will help ensure peace, the Bible shows that a warning power will emerge from Europe (Revelation 13:1-4)–and this is a power that thinks it wants peace but will act in a warlike manner anyhow per Isaiah 10:5-7. And that it will be a power that wants severe economic control per Revelation 13:16-18). The Bible teaches that prior to the return of Jesus Christ that Europe will be part of a peace deal (Daniel 8:25) that it will break (cf. Daniel 9:26-27 & 11:31), have problems (Daniel 2:41-43), ultimately become a real economic power (Revelation 18), restructure (Revelation 17:12), give its power to a leader called the Beast (Revelation 17:13) who tries to come in peaceably (Daniel11:23-24; who is also the military-political leader called the King of the North in Daniel 11:38-43), and have issues with the Anglo-American power which it will takeover (cf. Daniel 11:39), and will be considered as a successful warring power (Revelation 13:1-4). Moving toward full economic and political union in Europe is consistent with biblical prophecy. 22…and you shall be odious to all men for my name, but he that shall persevere unto the end, he shall be saved. 23 And when they shall persecute you in this city, flee into another (Matthew 10:22-23, RNT). 14 For we have not here a permanent city: but we seek that which is to come (Hebrews 13:14, RNT). 14 There is no permanent city for us here; we are looking for the one which is yet to be. (Hebrews 13:14, NJB). Thus, to claim that a city such as Rome could possibly be the “Eternal City” for Christians is to go against scripture as even Catholic renderings of scripture effectively prove that no single city, including Rome, could have remained the headquarters of Christendom for nearly 2000 years, if people are willing to actually believe what is written in the Bible. Furthermore, it should be mentioned if there was to be one city from the beginning to the end, it likely would have had to be Jerusalem (cf. Revelation 21:2) as the Christian church began there (Acts 2) according to Catholic, Protestant, Orthodox, and Church of God scholars. Paul would have worded his Epistle otherwise, if the community addressed were even mediately indebted to his apostolate (Merk A. Transcribed by W.G. Kofron. Epistle to the Romans. The Catholic Encyclopedia, Volume XIII. Copyright © 1912 by Robert Appleton Company. Online Edition Copyright © 2003 by K. Knight. Nihil Obstat, February 1, 1912. Remy Lafort, D.D., Censor Imprimatur. +John Cardinal Farley, Archbishop of New York). that have not heard, shall understand. 22. For the which cause also I was hindered very much from coming unto you (Romans 15:20-22, Rheims NT of 1582). There is no way that Paul could have written the above if he considered that he founded or co-founded the church in Rome as in these verses he explains that he did not first come to Rome lest he build on another man’s foundation. (Note: I choose to use the Rheims New Testament of 1582 A.D. as this is considered to the Catholic standard English translation of the New Testament). …it doesn’t appear that Paul ever appointed any one person as “resident bishop” over any of his churches…(Sullivan F.A. From Apostles to Bishops: the development of the episcopacy in the early church. Newman Press, Mahwah (NJ), 2001, p. 35). Admittedly the Catholic position, that bishops are the successors of the apostles by divine institution, remains far from easy to establish…The first problem has to do with the notion that Christ ordained apostles as bishops…The apostles were missionaries and founders of churches; there is no evidence, nor is it at all likely, that any one of them ever took up permanent residence in a particular church as its bishop…The letter of the Romans to the Corinthians, known as I Clement, which dates to about the year 96, provides good evidence that about 30 years after the death of St. Paul the church of Corinth was being led by a group of presbyters, with no indication of a bishop with authority over the whole local church…Most scholars are of the opinion that the church of Rome would most probably have also been led at that time by a group of presbyters…There exists a broad consensus among scholars, including most Catholic ones, that such churches as Alexandria, Philippi, Corinth and Rome most probably continued to be led for some time by a college of presbyters, and that only in the second century did the threefold structure of become generally the rule, with a bishop, assisted by presbyters, presiding over each local church (Sullivan F.A. From Apostles to Bishops: the development of the episcopacy in the early church. Newman Press, Mahwah (NJ), 2001, pp. 13,14,15). And that is certainly correct concerning Rome. There were no “bishops of Rome” in the first century and certain Roman Catholic scholars understand this, hence the idea that there is an unbroken line of bishops in apostolic succession from Rome and Rome being the “permanent world center” for the true Church is false (more information can be found in the article Apostolic Succession). And as far as the getting the gospel out to the world as a witness, the true church was not limited to Asia Minor. True churches were spread throughout many lands, such as northern Italy, France, Britain, Scotland, Ireland, Antioch, and elsewhere. “The type of Christianity which first was favored, then raised to leadership by Constantine was that of the Roman Papacy. But this was not the type of Christianity that first penetrated Syria, northern Italy, southern France, and Great Britain. The ancient records of the first believers in Christ in those parts, disclose a Christianity which is not Roman but apostolic. These lands were first penetrated by missionaries, not from Rome, but from Palestine and Asia Minor. And the Greek New Testament, the Received Text, they brought with them, or its translation, was of the type from which the Protestant Bibles, as the King James in the English, and the Lutheran in German, were translated.” — Dr. T. V. Moore, The Culdee Church, chapters 3 and 4, and Wilkinson, Our Authorized Bible Vindicated, pp. 25, 26 (As cited in Dugger AN, Dodd CO. A History of True Religion, 3rd ed. Jerusalem, 1972 (Church of God, 7th Day). 1990 reprint, pp. 90-91). So, it was Asia Minor, and not Rome that was the main location of the true Church of God in the first and second centuries, and even into the third century. And while a confederation involving Rome rose up in the second through fourth centuries, it ended up changing doctrines and not holding to original Christianity in many ways. Most people, Catholic or otherwise, simply do not know enough about the real truth about early church history. But they can if they are willing to look at the truth of what really happened. The Ephesus Church Era was predominant from 31 A.D. to circa 135 A.D. The Church of James, Peter, Paul, and John, etc. The Smyrna Church Era was predominant circa 135 A.D. to circa 450 A.D. The Church led by Polycarp, Melito, Polycrates, etc. The Apostle John He was an original apostle, early Christian leader, and the last of the original apostles to die. Iranian scientists have run computer simulations for a nuclear weapon that would produce more than triple the explosive force of the World War II bomb that destroyed Hiroshima, according to a diagram obtained by The Associated Press. The above statements confirm that the USA may well get involved with Iran. My reading and re-reading of Bible prophecy simply does not show that Iran will be a major player in Daniel 11:21-44 nor the deal of Psalm 83:4-8; though Ezekiel 30:1-9 possibly implicates Iran. Since Iran does not seem to be identified as the leader in those particular passages, and Iran has a loud voice in the Islamic world now, those facts have somewhat led me to conclude that Iran will somehow be “neutralized.” This neutralization may be from a regional war, internal war, economic pressure, and/or internal change. “Neutralizing” Iran would allow most of the other Islamic states (like Saudi Arabia and Egypt) to continue to exist (Syria might not do well per Isaiah 17:1) and allow for the rising of the prophesied leader (revolution in Iran, is also another possibility, for its “neutralization”). A reality is that Israel has stated that it cannot tolerate a nuclear Iran–and a nuclear bomb making Iran is a nuclear one. And leaders in the USA have suggested that it knows that the USA itself may intervene and attack Iran. But if the USA and Israel do hit Iran, Iran would likely not fair well, but that does not mean that the USA would not suffer. The USA, despite its military strength, is vulnerable to being hurt by EMP weapons, chemical weapons, dirty bombs, terrorism, and biological weapons. All of which Iran and/or its closest ally Syria seem to possess. And while the USA will NOT to eliminated by this type of conflict, the USA certainly could be partially or even greatly weakened by these type of attacks. If there currently is a “King of the West,” it would currently seem to be the USA, and the Bible does not seem to show it existing into the Great Tribulation (cf. Daniel 11:39). It likely will be weakened in many ways. Thus, unlike the military interventions in places like Libya, do not be surprised if the USA itself is not to be unscathed if it engages Iran and/or Syria. This would not be the Great Tribulation per se, but part what Jesus called “the beginning of sorrows” (Matthew 24:4-8) that could help further weaken the USA and make it more vulnerable for being taken over. Europe Concerned About USA ‘Fiscal Cliff’ and Some Are Trying to Give More Financial Power to Central Authority–A Prelude to 666? Now it’s Europe’s turn to worry about U.S. economy. American officials have been wringing their hands for the past two years about the heavy burden of government debt piling up in Europe. On Tuesday, Europe’s Organization for Economic Co-operation and Development warned that the U.S. “fiscal cliff” threatens prospects for the eurozone’s economic recovery. What people in the USA do not realize is that the fiasco of what is happening in Washington, D.C. is encouraging the Europeans and others to realize that the end of US dollar hegemony must come. Notice also the part I bolded above. The Europeans are questioning the long-term viability of the United States! And they should as the debts, etc. that the USA has been accumulating will lead to disaster beyond what most imagine (cf. Habakkuk 2:6-8). The European Central Bank said it expects to assume full supervision of all euro-area banks by the start of 2014 and that there is no need to change the law to accommodate its new role. Though there are some issues with various countries, including Germany, the Europeans plan to have a more centralized multinational economy that has the ability to overtake the USA–and this will happen according to Bible prophecy. The Europeans want the United Kingdom to get on board with their plans or get out. For a time, the European Beast power will be the world’s major economic ‘666’ power per Revelation 13 and 18. The United Kingdom is in a tough spot, but if thinks that relying on Europe will help it in the long-run, it will find that this will be a mistake (cf. Hosea 7:11-14). Alliances and political discussions (like trying to resolve the ‘fiscal cliff’) will not solve the problems of the USA, UK, or their Anglo-allies. National repentance is what is needed and that is not on the agenda of most politicians. Europe has a plan and keeps implementing parts of it. Most in the Anglo-lands still do not see it, but as Europe sees what is happening in the USA and UK, it is more determined to speed up its plans of being the dominant economic power in the world. It is getting much closer to being able to that than most people think. Barack Obama, Prophecy, and the Destruction of the United States This is a 160 page book for people truly interested in prophecies related to Barack Obama and the United States, including learning about many that have already been fulfilled (which the book documents in detail) and those that will be fulfilled in the future. It also has a chapter about Mitt Romney. This book is available to order at www.barackobamaprophecy.com. The physical book can also be purchased at Amazon from the following link: Barack Obama, Prophecy, and the Destruction of the United States: Is Barack Obama Fulfilling Biblical, Islamic, Catholic, Kenyan, and other America-Related Prophecies? What About Mitt Romney? Posted in Prophecy | Comments Off on Europe Concerned About USA ‘Fiscal Cliff’ and Some Are Trying to Give More Financial Power to Central Authority–A Prelude to 666? Yersinia enterocolitica, a lesser-known food-borne pathogen, was present in 69 percent of the pork products tested, according to a study released today by Consumer Reports. More than 100,000 Americans are affected by the bacteria a year, according to the Centers for Disease Control and Prevention. For every case that is confirmed with a laboratory test, about 120 more cases escape diagnosis. The bacteria can hit hard. Symptoms can include fever, cramps and bloody diarrhea. It is little surprise that the Pork Producer’s Council would want to question the conclusions of the study. But the fact is that Consumer Reports found that most pork it tested was contaminated. Of course, if humans followed biblical injunctions about not eating swine, there would be a lot less pigs, much less contact with them, and a much reduced risk of getting diseases from them. Pigs transmit a variety of diseases to humans, including potentially deadly ones (for more details, please see The New Testament Church and Unclean Meats and Pigs May Spread Deadly Ebola Virus). They may be a factor in some of the pestilences to come. Since mid 2009, I have done 74 radio interviews related to prophetic topics. Later this morning, at 8:05 am, Central Daylight time in the USA, 6:05 am Pacific Daylight time, I am supposed to do another. The radio station is WGEA, Geneva, Alabama at 1140 AM on AM dial. Jack Mizell and I will likely discuss information related to world events and prophecies related to one or more of my books and why the world will not be ending on December 21/22 2012. On the 4th of December 2012, I am scheduled to do a taped interview on WHAW, 980 AM on the AM dial, in Weston, West Virginia, with Stephan Peters, but do not know yet when that is to be broadcasted. Also, at 9:00 am Central time, 7:00 am Pacific time, is another radio interview. This is a short one with Patty Burns in Lebanon, Missouri, KBNN-AM 750 AM on the AM dial. Some readers might find one or more of interest. I expect to do a fair amount of interviews between now and the end of the year 2012–but do not often have the time to post about them in advance. I will try to mention some others in the next few weeks. 2012 e o Surgimento da Seita Secreta (Brazilian Portuguese Edition) 2012 livro do Dr. Thiel. Edição em português do Brasil. Este livro documenta e explica centenas de profecias. E desde que foi publicado pela primeira vez, pelo menos 24 já começaram a acontecer. Notice, that if this is true, notice that more and more cutting edge science is coming from a European, not USA, project. And leading edge physics’ projects often end up with military applications. CERN is the European Organization for Nuclear Research. It keeps coming up with more and more scientific discoveries (see CERN Announces Major Find: Another Step Forward for Europe, CERN’s Large Hadron Collider Particles Faster than the Speed of Light?, CERN Announces Progress, But Prohibits Its Scientists From Making Public Conclusions, CERN to Announce Potentially Exciting Findings in Australia, and CERN Makes Major Strides with Antimatter), which while assisting the scientific community, mainly will be of benefit to the Europeans. The Germans are also working on their own particle accelerator called FAIR (see Germany Approves FAIR Particle Accelerator Project), which, along with the LHC, seems to be putting them and the other Europeans ahead of the USA in such developments. Technology may be key to a powerful European military. One aspect could include particle collider research. The number of colliders in the U.S.A. has dwindled down to one under the Obama and Bush Administrations, and the remaining one is facing budget cuts and possible closure. Yet, in Europe, it now has the leading one in the world, CERN’s Large Hadron Collider (LHC) and in 2012, Germany announced that it is planning a possibly even more advanced one called FAIR (FAIR stands for the Facility for Antiproton and Ion Research). I believe that Germany’s FAIR, along with the LHC and other technology, will help the Europeans produce military weaponry to fulfill certain end time prophecies. Since Revelation 13:4 is discussing what seems to be a unique type of warfare, this warfare likely includes certain high-tech weapons (electromagnetic pulse, neutron, unique delivery systems, etc.) that will be effective for a while (ultimately the Europeans will be overcome by what appears to be a Russian-led, mainly Asian, confederation, cf. Jeremiah 50:41-43 & Daniel 11:44, possibly by exploiting some technological flaw, like creating a software virus, etc., while also amassing troops, etc.). The FAIR and the LHC projects are also likely to spin-off economic benefits that may help propel Europe to be (for a short while) the economic leader of the world (cf. Revelation 18). Both of my books quoted in this post discuss the Large Hadron Collider as one of the items that may provide the Europeans with the ability to overcome the USA’s military might. And while many think that this would be impossible, as the Europeans continue to uncover previously unattainable aspects of physics, it is getting more and more technology that could be developed in that direction. The fact is that the Bible shows that the land with the strongest fortresses (strongest military) will be taken over by the final (European) King of the North. The Church of God understanding that the Europeans, essentially under Germanic leadership, will be able to attack and takeover the United States and its Anglo-descended allies (cf. Isaiah 10:5-11; Daniel 11:39; Zechariah 10:6-11) is correct and will come to pass. And it appears, to me at least, possible that CERN’s history of successes and new discoveries is consistent with biblical prophecies. You are currently browsing the Church of God News weblog archives for November, 2012.